Homemade calzones are a step up from Friday pizza night. Make this easy dough recipe from King Arthur Flour then customize your toppings. Start simply with marinara sauce and cheese and progress to vegetable fillings, meat fillings or a combination of the two. I am excited to share this calzone today. So many cultures have a bread that is basically a standard type of dough folded over to make a pocket filled with meat, cheese or vegetables and then sealed around the edges to create a handheld, portable food. The calzone seems to be the Italian version and is nothing more than a pizza folded in half. You could even make homemade calzone with pizza dough purchased at the store or from your local pizzeria. I have fond memories of eating calzone as a lunchtime treat at my first job out of college. Two co-workers and I would walk to a local Italian spot in Philadelphia and we’d feast on these massive calzones. My waistline would only have been able to manage this a few times a week in my early 20s! Damian and Bob, these are for you! As I often do when looking for a reliable bread recipe, I turned to King Arthur Flour for their recipe. The fillings are fun– make it your choice and change it up. 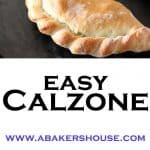 I used three different types of fillings for my calzone and couldn’t name a favorite– they were all special! I look forward to baking bread every month with this group of bloggers, won’t you join us? #TwelveLoaves is a monthly bread baking party created by Lora from Cake Duchess and runs smoothly with the help of Heather of girlichef, and the rest of our fabulous bakers. Now, just for a quick look back I will share the first photo I posted of a calzone over three years ago. Thanks to my mom and my few other readers then who kept reading even though the photography left A LOT to be desired. Even today’s photo is not perfect but I am sure we can agree that it is greatly improved. I hope to look back in another three years and have an even better photograph to share; I am looking forward to daily improvement. (And, no, when I originally posted these photos I did not know how terrible they were!) So if you are just starting out with your food photography, keep practicing– I will continue to do the same! Posted in January 2012. Yes, that was an attempt at a calzone. And, yes, I happily ate it! My original thoughts were that the oozing cheese was wonderful; my opinion now is that it looks like some sea creature from the deep! Homemade calzones are a step up from Friday takeout pizza at our house! I hope you enjoy them too! Mix all the ingredients together in a large bowl. Once the dough is formed, turn it onto a lightly floured workspace and knead it. Knead the dough for a few minutes. It will become smooth and easy to handle. Place the dough in a lightly greased glass bowl. Cover with plastic wrap that is coated with baking spray. Let the dough rise for one hour or until doubled in size. One the dough has risen, cut the dough in half if you wish to make 2 large calzones. Alternatively cut the dough into 8 pieces to make individual calzones. Roll the dough into a circle (like a pizza dough) then add marinara sauce and cheese. Place the formed calzones in a parchment lined tray, cover and allow to rise again for 45 minutes. Preheat the oven to a hot 450 degrees F. If you have a baking stone, preheat it at this time as well. Make a quick egg wash by combining the egg and water. Brush it over the dough. Make a few cuts int he calzones so that steam will escape during baking. To create baking steam in the oven add a pan filled with a few cups of water in a roasting pan on the bottom level of the oven. Bake the calzone for 15 minutes at 450 degrees F then turn down the temperature to 400 and bake for 30 more minutes or until golden brown. If you are making two large calzones, cut each into 4 pieces. Calzones are excellent made ahead of time and reheated. Or freeze the risen calzones and then bake them from frozen. You'll need to lengthen the baking time by about 15-20 minutes if you bake from frozen. Oh calzone, how I love you! Holly, you cracked me up with “sea creature from the deep.” Lovely baking with you this month for #TwelveLoaves! Thanks, Dorothy! Nice to see you baking again this month! Your rosemary and beer bread creation is still on my mind hours after I read your post. Oh, my last reply got muddled up– I hope I corrected it to say that I really enjoyed your rosemary and beer bread today. Hope to bake again with you next month! Not just a huge improvement in photography but in technique as well. What a gorgeous calzone; love the trim Holly. And now I’m hungry! I would have gladly eaten that sea creature from the deep. It looks delicious to me! Love all that oozing cheese! You can’t go wrong with cheese plus more cheese! 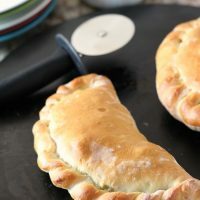 How delicious Holly, I love calzone and would love to try this. You have definitely come a long way … your calzone for this month’s Twelve Loaves looks practically perfect! Curious what you filled them with! Oh yes the fillings were fun– a pesto and ham filling, a traditional tomato sauce and cheese, as well as a Mediterranean version with sun dried tomatoes, olives and feta cheese. 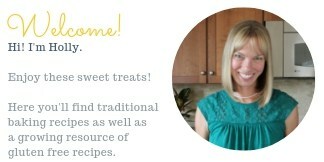 Thanks, and yes, fortunately at my house we eat my baked goods even if they are not picture-perfect! I was just thinking about how gorgeous your photo was, and cracked up when I scrolled down! How far your skills have come! And I still have a long way to go! I will say, though, photography is much more fun now that I have some basic skills, same goes for my baking! Do you know I learned in my quick internet research of calzones that Philadelphia likes to claim creation of the Stromboli but that the Italians have been making calzones in that rolled fashion or the folded over method for years. For me it doesn’t matter who started it– I will eat both a Stromboli and a Calzone any day! As long as my learning process means that I can eat my way through countless cookies and breads, I am up for it! Thanks, Lora! It is amazing how much one can improve! Now if I could just get the camera to stop moving! Love calzones, Holly. Whatever you do though, do not let your son bake them in your kitchen and sell them at Red Rocks! And that is the short story! Since I’m a child, I cannot resist to Calzone. Yours look great. King Arthur Flour’s recipe are always reliable. Great choice! l’ve been looking back at a lot of my older posts and photos lately, too. It’s awesome to see how far we’ve come over time. 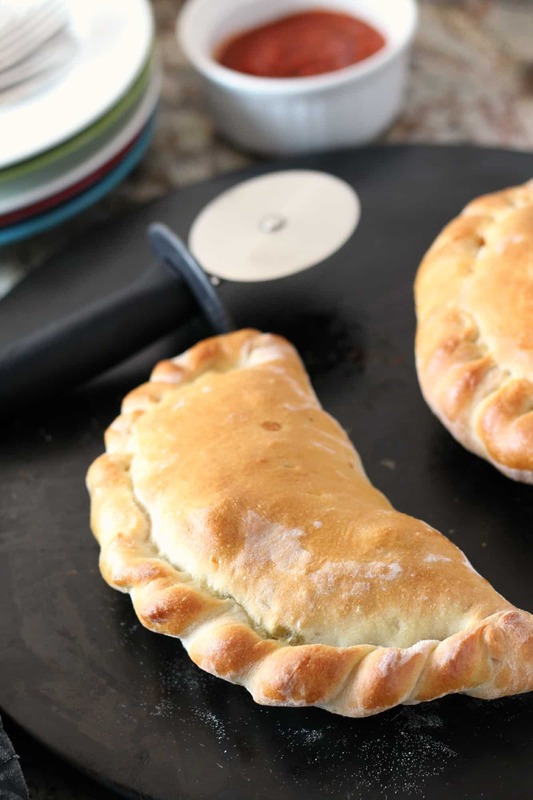 Your calzone looks amazing – my guys (and girl) would love this!